The registration period generally runs from 1 September to 31 August although some leagues may have different registration periods. MSSA will adjust the registration period for such leagues. The fee for premier or standard registration covers the entire year/registration period. The fee is collected only once for the year. Tournament Player Registration is limited for league or tournament play. It runs no longer than a 7-day period. It may not be used for cup play. Players may transfer to other teams or be registered for more than one team. Once registered, the player is still considered registered and does not need to pay any additional fee. Registration may be upgraded as long as the appropriate fee has been paid. Fees include registration with USSF & USASA. It also includes insurance coverage for liability as well as participant accidental for players. League fees are set by the individual leagues. For information about affiliating your league, click HERE. All fees are on a per player basis. There are no team fees. 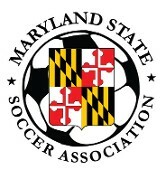 For players not registered with an MSSA affiliated league who intend to play in a USASA sanctioned tournament in Maryland or elsewhere in the U.S. Click the button below. The registration fee is $10 and can be paid online by credit card. Submit a head shot/selfie as the photo. Do not upload driver's license. If there is any problem registering or if you are unsure if you are registering in the correct program, email MSSAFalcone@msn.com.